Here is a short review of Heartland's Road Warrior RW 381 CK . It's Springtime and a Gals thoughts turn to tradin' up. 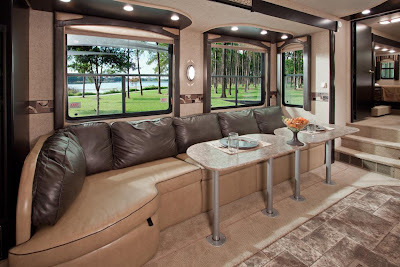 Not that I am unhappy with our 2011 Road Warrior 361, in fact I'm delighted with it and would be hard pressed to exchange it for any other type of RV, up to and including the big luxury Class A Motor Coaches. But, one does get curious to see what's up with the newer models so I slipped over to Heartland and did a lookabout. I was a bit dismayed by the initial shock of black cabinets, but I found that you can still order the Cherry cabinet version as an option, so I guess I can live with it, in fact, the black cabinets actually look pretty nice once the initial shock wears off, (as a caveat we sometimes stay in the shade and RV's are a bit dark, adding black cabinets would do nothing to improve the situation). 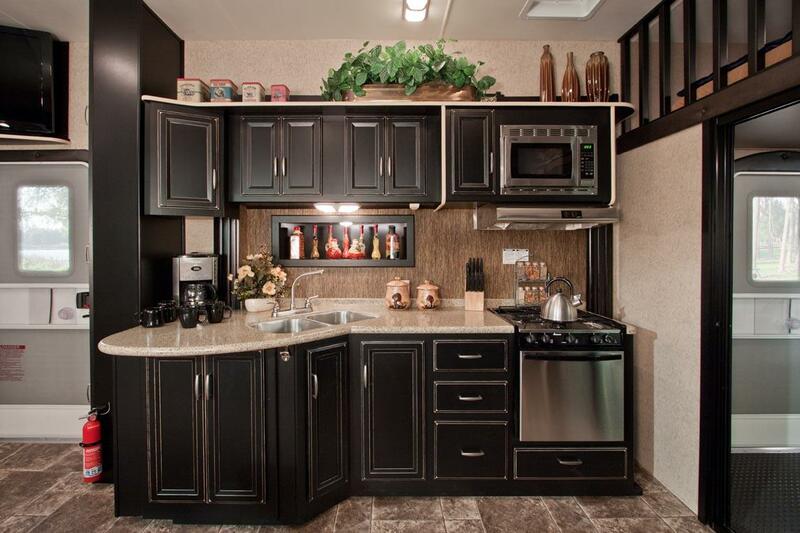 The stainless appliances are very sharp looking next to the cabinets. What I don't care for is the benchette dining lounge, why on earth do the Good Folks that plan RV's think we need seating for a dozen of our best friends at all times? We, of course, would pull out the entire unit and replace with our desk set up, as we did with our present unit, but this would leave me with some awkward holes in the floor, (I'm sure there are caps, but really, are these toe jammers or what?). Again, the great minds have decided to go the "Bar & Lounge" look, even to the point of hanging the TV at the ceiling above the entry door. This would kill my neck, but that's just a personal problem for myself. 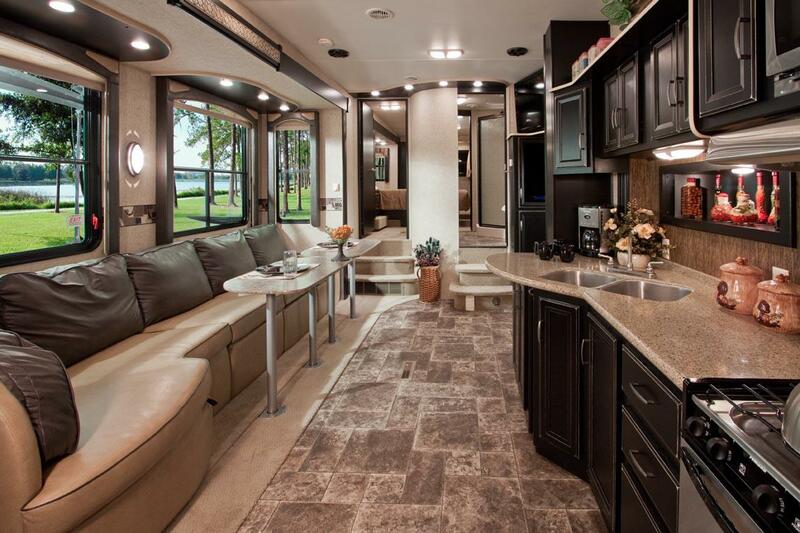 What could be really nifty about the 381 was the hint in the floorplan of there being a "Camp kitchen" in the kitchen slide out for outdoor cooking. If this is truly the case, (why they don't provide even a snapshot of it is a total mystery to me), this would be a HUGE selling point for me! If it had a TV mounted in it, even BETTER! I might never have to go inside again other than to sleep! All in all, this unit is very nice, it looks as if you can access most of the interior if the slide in in too, a big plus for us Full Timers who want to pull in a parking lot and just grab a snack and a nap before we head out again without putting out the slides. I won't go too deeply into the specs on this unit, suffice it to say it has the best in the industry and if you need more information, I would click on the link provided at the start of this article. I'm also not going to describe the bedroom and bath, they aren't that much changed form any other Heartland Fiver layout, nothing new here and you can go to the site if your curious. I featured this unit as it most closely resembles our unit in size and layout, (other than the garage is only 12' where ours is 14'), unfortunately, our exact layout seems to have been discontinued, just why, I am not sure, but I wont be trading in Our Gal anytime soon on this model, although I concede it does has some very fine features that others would appreciate! Funny, I think looking at the "newest" thing is something we all like to do. I have to agree with you on the bench seat plus to me it did not look like it would be all that comfortable if you wanted to sit there for a while. We still find ourselves looking at listings online even though we are completely happy with what we found and have finally started our traveling life.